Q: Why does Andy kill the the man on the drug dealers bed? He was unconscious, so he couldn't see what happened. Q: Why Doesn't Hank Know His Mother is Working? Q: What's the significance of the incident when the Charles backs into the cop car? 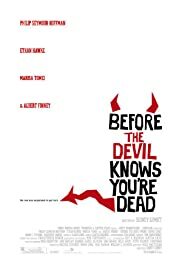 Sydney Lumet hasn't had a box office hit in 20 years and yet at 83 has managed to churn out a tight, well-cast, suspenseful thriller set in his old stamping ground, New York City. (How he got insurance, let alone the budget after all those flops, is a mystery also). The story is a pretty grim one and the characters are not particularly likable but it held me on the edge of my seat till the final scene. Two brothers with pressing financial problems conspire to rob a suburban jewelry store owned by their elderly parents. The only victim is going to be the insurance company. The robbery goes awry and two people die. Most of the film is concerned with the aftermath. The action is non-linear and seen from the main character's differing points of view, but it is not difficult to follow. What is not so easy to work out is the back story  how did the brothers get into such a mess? There are clues  the younger brother being the baby of the family is his fathers' favorite while the older brother seems to be carrying a lot of baggage about his relationship with his father, and vice versa, but that hardly accounts for him becoming a heroin-using murdering embezzler. 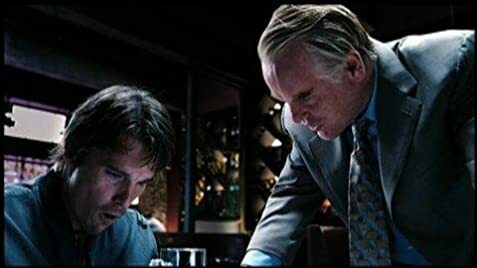 As the scheming older brother, a corpulent Philip Seymour Hoffman dominates the film, but he is well supported by Ethan Hawke as his bullied, inadequate younger brother. Albert Finney as their father seems to be in a constant state of rage but then the script calls for that. Marisa Tomei as the older brother's cheating wife at the age of 42 puts in the sexiest performance I've seen in many a year. The film literally starts with a bang, but we are out of that comfort zone pretty quickly. I don't know the origins of this story by first time scriptwriter Kelly Masterton but I suspect that like Lumet's great 70's film "Dog Day Afternoon" it is based on fact  it's too silly to be untrue. Lumet is just about the last of those immensely versatile old-time craftsman studio directors who with immense speed were able to direct just about anything that was put in front of them. Some great films were produced that way as well as some classic turkeys. This isn't a classic of either sort  it's a well-crafted piece of downbeat entertainment. It will probably leave you feeling that you were lucky not be a member of a family as dysfunctional as this one, but still wondering as to how they got that way. We do know the parents were happy but we see so little of the mother and hear so little about her it is impossible pick up on her relationship with the boys. (There is also a daughter whose presence seems redundant). Well, like Tolstoy, we have to conclude that "each unhappy family is unhappy in its own way". 80 of 112 people found this review helpful. Was this review helpful to you?